When you’re dealing with natural materials, I like to stay in the earth tones for trim color. And there’s nothing more striking than a dark wood door on a stone facade. For me, it just conjures up images of castles and old English cottages. Choosing colors that come out of the natural variation in the stone or brick makes the most sense to me. Yes, we’re talking creams, taupes, and tans. But depending on the tones in your stone or blond brick, you could lean in the clay red direction or chocolate brown. Keeping the house natural may seem blah, but that’s the way the house would look if it were built centuries ago. Don’t ignore the roof color though, and if you’re choosing a roof for a stone or brick house, I would avoid a lot of color variation on the roof. It will look really busy if the roof is not a solid color. Some people like that — but I get migraines. Hello My husband and I are wanting to piant our trim, garage doors, and our front door. We are having a problem trying to decide on a color though because our brick is ORANGE!! Different colors of orange, but still orange. I am affraid that if we decide on a bold color (which I love on other houses) it will clash. Right now the trim is a cream and the garage doors are the same color. I don’t mind the colr but the front door really needs painted. What color do you recommend? I like your idea of painting it black with a gold faceplat and door knobs. Will that look alright if the garage doors and the trim stay the creamy tan color that it is? I would actually paint the front door and the garage doors black. But keep the cream trim. That will look really nice. Although I always recommend keeping the garage doors the same as the body of the house, I make an exception for brick. And black will really dress up the house. paint it a slate blue for contrast eg to make it stand out. If you want the door to blend then paint a creamy yellow or a terracotta red. You should not try to match the door to the color of the brick. Thanks for your input, kc. Your recommendations will give the house a fresh contemporary look! Our brick house (the brick is more than one color – has hints of kind of an orangey red, white, and some brown/black). It also has brown replacement windows which I cannot afford to change. It currently has yellow siding, yellow shutters, and a yellow front door. We have to replace the siding because it has holes in it. I am very confused as to what color siding and shutters and front door to get. The entire neighborhood has either beige or white siding. I was thinking about a dark green siding with a wine colored front door and wine colored shutters. But now that I read dark colors make a house look smaller, I am afraid. I don’t want our house to look funny. I want it to look pretty. The front of the house is solid brick with the brown replacement windows showing. You can only see the siding on the sides and back. I don’t know if I gave you enough information. Can you give me some help, or would you need a picture? Thanks for your question (and your best wishes) — much appreciated. As for your house color, I would go with one of the earthy tan colors — something that approximates the grout color in the brick. That will blend the front with the sides and back beautifully. Then, I would go with bronze for the shutters. You already have brown windows so the bronze will just look like an extension of the window frames. Adding another color would accentuate the brown windows too much. The doors can either be bronze — very classic look — or a darker version of the orangey red in your brick. The key to brick is to stick with the colors in it. You can go lighter or darker, but as soon as you add another color, like green or blue, you chop up the house and make it look smaller. The dark colored shutters and doors provide contrast with the brick and really make the house look classy. Forgot to say one thing. If you go with the classic dark bronze look, you can always add more color with your house accessories: the wreath on the door in dark orangey reds, the pot of flowers by the front door, etc. All of those accessories can be changed out with the seasons. A great way to add a little more pizzazz to your classic brick house. Thank you so much for getting back to me Barb. I feel a little less stressed now. Just two more questions if you don’t mind — I was actually thinking about removing the shutters (there are only one pair of them outside our bedroom window which is located at the front of the house). The big picture window in the living room, does not have shutters. I thought not having shutters at all, would show off the brick better. What do you think? Of course that changes if the brick under these shutters is a different shade from the rest of the front of the house. Also, do the other doors (side and back) have to be the same color as the front door, or should they be brown? Right now the back doors are brown and the side door is yellow. Thank you again. How wonderful it was to find your site on the internet. I came across it by accident. You are such a God send. Sure, you can remore the shutters from your bedroom window. It doesn’t really add much to have just one set of shutters (also fewer places for bees to nest!). And your doors do not have to match. The front door is the primary focus. The others are functional only and can be siding color or something else entirely. I would like to send you a few pictures of our stone house. How can I send them to you? I have a tan, off white and grey stone house with black grouting. I would like to change the color of the trim around the house and windows, get a new front door and a new roof. Also, we have a side and a back door, what color should those be? We also want to add shutters. Any color suggestions would be much appreciated!!!! If you scroll through some of the other comments, you can see how other people are sending their snapshots. I think you can just embed a URL address of any jpeg photo. Or provide a link to one of the photo websites like flickr and I’ll see your photo there. I’ll look forward to seeing your house photo and then I can better answer your specific question. Hi – my house is in an all brick neighborhood. It’s mostly brick (tanish colors with dark brown random bricks) and has wood siding all around the front door. The one side of the house makes a huge triangle pointing upwards and that triangular part is also wood. The brick, wood trim & doors are pretty much all the same color. Roof is optional because we are getting a new one put on. What do you suggest is the best color scheme for this house? I’d love something very welcoming & full of personality, but still classic and semi-neutral. I was thinking of painting the wood, trim & doors all different colors…. Thanks for your question. Without actually seeing the brick, I would suggest going with the dark rich brown color in the brick for the wood siding. If the brick is mostly tan, the brown will provide a nice contrast in those areas like the high peak where the wood siding is. Then for the trim, you can choose a cream that will blend with the brick. For the door, you can choose almost anything that provides a nice contrast and a welcoming feeling you’re looking for. A clay red might work or if you’re inspired by the current brown/light blue trend, you could paint the door a soft blue. Very different but nice with the brown. Wow that sounds very intriguing… I was thinking I should paint the wood the lighter color because the dark might make the house look small and darker… but I’d be willing to take a leap of faith! I love the idea of the soft blue door. I think that would add a great richness to it. What about the roof? Any color ideas? Since your house sounds architecturally interesting (with the high peak on the side), the brown with the brick will really set it off. Don’t worry about the dark color since you have mostly brick anyway. I would go with a traditional dark roof color, either dark brown or black. Either one should work fine. Hi Barb, Sorry to bother you again. This should be the last time. First, thanks to you we picked out a beautiful vinyl siding (wicker). The guy came this morning, so the timing was perfect. We also will be getting a side door and back door (they both needed to be replaced) in almost the same color as the siding. With the brown vinyl trim around each door, they should look nice. The front door will be painted an orangey red (I have some paint samples to choose from). Now for my final 2 questions: 1) Should the attached garage door (front of the house) remain brown, or should we paint it the same color as the siding. 2) Should we paint the handrail black (we have a black fence in the back of the house), or leave that brown? 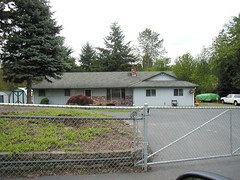 I have posted a photo of our house on that flicker site. I hope you can see it. Thanks for the photos — very helpful! It looks like you have brown brick above the stone. I assume that isn’t changing. But if you get a chance to paint it, I would suggest a taupe that would blend more with the stone. Your house will look bigger if that peak blends in. Sometimes you want high contrast to highlight the stonework, but not in your case. The brown trim is just too dark. I would either go with taupe or cream for the trim. For the front, I would suggest getting a solid wood door. That would really enhance your European cottage style. The side doors can just be the trim color since you want them to blend in more. Stick with brown for the roof. Forgot the shutters. You can have brown shutters as long as they’re not too dark. The color should be in the stone somewhere. A medium brown would work and would coordinate with your new brown roof. Whatever trim color you choose should go on the window trim as well. 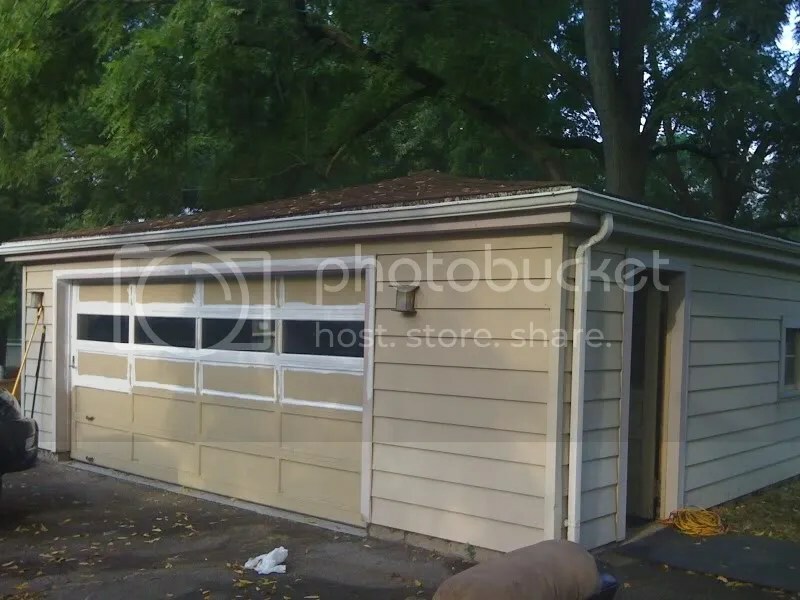 Keep the garage door brown so it blends with the brick. No need to call attention to the garage. And I’d paint the railing black to dress up the steps a little. I do think the dark brown color would look very nice, as the bricks are a lighter color than the picture seems to show. But I just wanted to make sure you still liked it when you see where the wood is on the house. There is wood paneling all around the door (which is featured close up in the 2nd picture) and then there is trim. Which you suggested to be a lighter cream color. The little mini-awning with open-exposed beams on the left, pop-out window over the kitchen (on the side of the house) and the entire top sides & back of the house are wood which are painted that ugly brick red color. Do you think I should paint all of that the deep brown color as you suggested? Or should I paint it the light trim color? Or introduce another accent color? My husband wondered if it would look top heavy from the sides if the top was brown and the bottom was the lighter brick. I’d welcome any landscaping ideas! Not too much work but I feel like those bushes are pretty bad…. I’m SO glad you sent the photos. When you said your house had a peaked roof, I pictured more of a Victorian cottage look. Not at all. So I’m going to back-pedal out of my original idea. Here’s what I suggest. I would go with a brown roof, something that won’t be as heavy as the black is now. Then cream trim will lift the roof up a bit as it’s very dominant right now. As for the open trellis, I would paint it brown to blend in with the roof unless you want it featured. As for the front door area, it’s very dark in there. I would pick a medium tone from your brick, a taupe would work, and paint the wood paneling. Cream trim in there around the door and windows. The front door can be a rich chocolate brown or a darker version of one of the brick colors. The darker door will stand out against the taupe and cream and look really nice. The rest of the house, including the peak, could be painted in the taupe or whatever medium-tone neutral you pick that will blend in with the brick and not make the house seem top-heavy. The brick is very busy, with its multiple colors, so I would keep it simple with neutrals everywhere else. As for landscaping, I would dig up both of the big bushes and start with a variety of smaller shrubs on both sides of the front walk. Make the garden beds curve a bit to counteract all the sharp angles in the architecture. I would add mostly green shrubs and maybe red barberry as you’ve already got lots of color from the brick. Hmmm…. I’m a bit sad. 😦 I kind of liked the idea of the darker brown. I was driving around and it seems like EVERY house has a lighter cream/taupe color on the wood accents and I feel like it makes the house look boring. I did see some that had darker wood and light trim and I thought it looked pretty nice… Or at least, different! (As you can tell, I like things that are a little more unique). I do agree that there is a lot of busyness going on and it might be good to stick with neutrals. Is there a way to do that and make the house seem a little bit different from ALL the others? I just took some new pics and I think I’ll send those to you. They are much more crisp and show the correct colors. They are in late afternoon light. I like your idea about the landscaping…. Do you think it would be better not to feature the trellis? You can just go through the slideshow… there’s 7 of them. The new photos were great. Much clearer. I do agree that the taupe/cream combo with your brick is the safe way to go. But you seem far too hip for anything so traditional, especially when everybody else has already thought of it. So here’s what I recommend. I would get some big poster boards and head off to the paint store. (Your house is so unique that it’s going to take some experimenting before you make a final decision.) On the first board, I would paint a nice rich dark chocolate brown (from your brick). Then paint one board in a rich cream. Then choose another color from your brick, maybe a lighter soft cocoa brown. And then an accent color for the door– you can certainly try a soft blue like Benjamin Moore’s sapphire ice (808) or something more earthy, like danville tan HC-91 (do I see some green in that brick?). Then try them out in different locations and combinations. I’m sure the dark brown will look good and it won’t be any more top-heavy than the red already is. One thing I would be sure to do is lighten up your front door as it’s hard to find at the moment. Even cream would be better than the dark red. As for the trellis, I would keep it the roof color, but it’s totally up to you whether or not to feature it. If it’s in great shape and you want to draw the eye to it, then paint it the trim color. Hope that gives you some direction. If you’re ready to paint, then go ahead and paint right on the house. You’ll be able to see the colors better. Thank you so much for your helpful suggestions. Above the stone are roofing shingles, not brick. That is something that the previous owners left us to deal with. We are definitely taking that down. Wood is underneath it. Should I place fish scales on top of that or some other type of shingle, or just leave the wood exposed and paint it taupe or cream? Also for the solid wood door, would you just stain it and leave a natural wood color, or would you paint it another color? Also what type of door knobs and knockers? I was thinking brass, but if the door was a natural wood color, I would probably use black cast iron or something black. Just wanted to thank you for sharing your great tips. My husband surprised me yesterday, and took the yellow shutters down. I can already see a big difference. You were right, they served absolutely no purpose. Also, appreciate your compliments on our yard. I know my husband was very flattered. Thank you again. Thanks. And good luck with your project! See what’s under those roofing shingles and go from there. I don’t think you need fish scales though. Once you paint the wood, the focus will be on the stone. A solid wood stained door would be nice. If you go with a mahogany stain, you can go with either brass or iron. Whichever you prefer. I think brass would add a nice finishing touch to the house and dress it up. Thank you so much! I can’t wait to get started. When complete I will send you pictures!! i have a yellow brick house and would like to know what colors will go great with it. my roof is desert sand. and we have a wood front porch.(deck). even the colums are wood. i want to paint the trim and the porch and also the foundation. what colors are good. Since your roof is desert sand, I would stay in the brown family. So you can try a creamy ivory for the trim and porch. Check out your grout color and see if it’s a color that’s feasible for the porch floor. If you don’t like it, then I’d use brown. White would also work for your trim color and porch. But it will stand out more than the ivory. Just make sure you paint the porch floor a dark color — for dirt. I am looking for advice on a color for my front door. If I painted the front door purple my husband would say, “that looks great!” I really can’t get advice from him! It is wonderful that you are offering such helpful advise! My house is a bungalow with grey brick (not stone) and the roof is solid dark brown. The garage door and all of the trim is also chocolate brown. My sidewalk and front porch are done in a very dark brown stamped concrete. I would like to replace our front door. What color would you suggest as an accent color for the door? Well, you’ve got lots of dark color going on with the gray and the chocolate brown. A couple of colors come to mind. (I haven’t seen a photo of your house or your neighbors’) but you could try warming up the house with a raspberry front door. It looks great with both gray and brown. Or a gray blue (to go with the gray but contrast with the brown). Those combinations of brown with pink or light blue are pretty popular, mostly with interiors, but you’ve got to do something to add a little sparkle to your abode. And the front door is a great way to do it. Good luck. Hope I helped a little. Just a couple of more questions please. I just can’t seem to be able to pick out a color for our front door. I am really hung up. I have some red samples taped to my yellow front door, and they all seem blah to me. Question 1) When you said orangey red to go with the solid front brick, did you have any specific shades in mind? 2) How about when you initially said bronze, did you have any specific shades in mind? I don’t find the 2 big box stores to be all that helpful. They just want you to pick out the color and they will mix it. 3) If by some miracle, I could afford either a make believe or real wood front door, what type of wood would go best. Of course, what is funny here is that we have a storm door which is mostly glass and outlined in brown. I think that is funny because will I really be able to see that front door I am so hung up on anyway???? Oh well, thank you again. Whatever you can advise would be so appreciated. handful of mulch from your front yard and head into the paint store. They should be able to match the darkest color in the mulch. Kind of different, but warm. Thanks Barb. I tried that with a shutter our siding contractor loaned us (which totally matched one of the colors of brick, the sidewalk, and our mulch), but the machine at the paint store did not like the shutter. It kept picking up green. So we tried our eyeballs. Anyway, I will try the mulch, which I never thought to do. We just came back from Salisbury Mass./NH from vacation. Beautiful area. Thanks Barb! I was thinking of Burgundy for the front door but I think you are right with the raspberry. Raspberry would probably give everything a lift! The brick on the house is a very light grey so the house is not real dark. There is just so much of the chocolate brown that it needs something to give it a punch of color. I will probably paint the original door raspberry to make sure I like it before replacing it with the new door. If raspberry doesn’t work, I will go with the blue grey. I can visualize the raspberry though and it’s looking great! I have a plain, blond brick house in the midst of hundreds of houses that are red brick, blond brick and combination thereof. The motar is gray, the roof is gray with flecks of brick red. I’d like to try to make my house unique by changing the color of the trim and garage door. Currently, everything is white. What do you suggust? Brick houses get special treatment. I usually suggest that the garage door be the same as the house color, but with brick it’s different. Your blond brick house needs a little weight. So I would suggest a rich chocolate brown garage door and front door. And I would suggest (when you want to spend a little more money) a full-view screen/glass storm door so you can see the front door clearly. As for trim, I would go with cream. I know it doesn’t match the grout color, but with the yellow brick, it should blend beautifully. 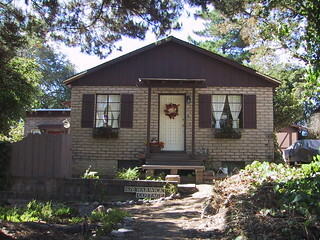 We are renovating a cottage in Cambria, Ca. Right now we are calling it “Lipstick on a Pig”, but it is improving with every project. Next is color on the outside. The body is an unusual blond brick with a mortar that seems to be almost a light sage green. Currently, all wood trim is a dreary dark brown. We need help with an updated color scheme. The only for sure color is red for the doors. Would like to send a photo, how do we do this? Would love to see a photo of your house. Most people just send a link to a photo website like Snapfish or Shutterfly. You can scroll up to see how others are doing it. Please take a look and tell us what you think would work. The photo helped a lot. How about cream for the trim. It may sound boring, but it will blend with the brick and make the whole house seem larger. You could even go taupe (or sage or another color taken right from the brick or mortar) for the siding and shutters on the brick. Then you’ll have a red door that really pops. If you could change out the door before painting it, that might help. The pattern on the door is the same scale as the brick and it’s a bit busy. A less-textured door would work better. We have a brick tudor in a neighborhood of brick tudors/craftsman/bungalows (very 1930s). The brick color is a brownish red, recently repointed (previous owners). Our front door is a lovely solid wood that should never be painted, it’s beautiful! But I’m struggling with trim colors. Our grout is a taupish-grey, so I was originally thinking slate…but our roof is a dark composite so I thought that would be blah. With such a beautiful door, I would go with cream trim. That will provide contrast with the brick but will avoid calling a lot of attention to the trim (green might do that). You want people to focus on the front door. First, let me state that your site is great! I am a few months into the construction of my new home and I have become numb with my color selection. I have the interior 100% (until the paint hits the walls that is :), but I am semi-lost on the exterior color. I have assembled samples of what I have decided on for roof color and stone. I read your previous post about color choices based on shingle colors, but the wild card I am dealing with is the stone that will cover most of the front of the house. Does the addition of stone change your opinions on house color based on shingle color? The house is being building in Central Florida and the exterior will have a stucco (floated/semi-smooth) finish. Besides the stone the house has a large amount of accents (bands around the windows, massive crown moldings, etc). I believe the black shingle pulls the grays/whites/blacks from the stone. I am not 100% sold on the door color… so do not consider that “cast in stone”. Any input you have would be greatly appreciated… if you have a color wheel for a paint manufacturer and a paint code in mind… I have them all 🙂 (porter, coronado, sw, bm, etc). You’ve undertaken a big project! And have made great decisions. I love the stone. It adds so much texture and color to the front of the house. With a black roof (different from the rendering, right? ), you might consider a warm light gray for the body of the house. That way, you have taken into account the roof color and have also allowed the browns in the stone to pop out. The gray will will also accentuate your brown solid wood door, and that’s what you want. The alternative, of course, is to stay in the light brown family for the body of the house. But that will accentuate the gray in the stone as well as the roof color. Both a warm gray and a light sandstone color will work with your home but each will accentuate different things. If I were closeby, I would be happy to give you specific paint colors, but Florida is a bit far for a house call, I suspect. Hope I gave you some direction. I have a brick house with a cream color for the trim, mudroom door (seen from front of house), garage door, and gutters. My front door is wood, and it is black. The house is all brick and the brick is very visibly multicolored. I see cream, dark red/burnt orange, lots of chocolate brown, some greys, it’s a real earthy mix of colors. I want to make the front of the house have some punch to it. We need new gutters and we also need to repaint all the trim/gargage door/doors, so I am in need of your help, as the right colors are just not apparent to me. Also, I’m considering adding shutters. I like the arched kind, and I’m thinking black. 1. Based on my pics do you think shutters would look good, and are they needed? 2. If so, what color would you recommend? Thanks so much for your help! I am enjoying your site. I am dying to hear your thoughts! I got a Try Again when I clicked on your shutterfly photo. Would love to see it before making suggestions. I can’t seem to get it to hyperlink correctly. Try to copy the link and then paste it. If that doesn’t work I will try again later today. I got your photos. I think what the “problem” (actually your house is very nice-looking!) is that the trim is very bright and makes a sharp contrast not only with the black door but also with the brick itself. The trim really stands out. You might consider moving toward more of a taupe color taken right from the grout/brick. That way the trim will blend better with the brick and will not be such a contrast. The black door is fine as you have the black storm door anyway and your roof is very dark gray. As for shutters, I only saw two windows, but black shutters would look very nice. I think when you soften up the trim color to blend in with the brick more, your house will look more pulled together, a bit larger perhaps, and quite elegant with the black door and shutters. There won’t be a lot of color, but you can add that with flowers, shrubs, wreaths, etc. If at some point you need another roof, you might try a dark brown which would look even more smashing with your brick. But dark gray is fine. Thanks, Barbara! I will go with a taupe for the trim and gutters, do you recommend using the taupe for the garage door, and the wood sides of the front door (they are cream now – I don’t know the right name for thes side things). Taupe for all of that? What style garage door do you recommend for this style house? Thanks so much! You’re great at this! We have a greyish stone Tx Hill Country Home with a contempory flair that we just purchased. We’re looking to repaint the trim. Most likely the neutral grey/clay color that blends in. can we paint the front and/or upper porach dorrs a different color? If yes what color scheme might work? Any ideas would be great…….. Yes, I would use the taupe for the garage door and the side lites around the front door. Everything that’s cream currently. As for the garage door style, I like what you’ve got. It’s very plain so it doesn’t compete with the brick. I like solid doors with no windows. as they don’t attract attention to themselves. Hope that helps you. Good luck. Do you think my house would look good if I painted the door Newport Blue? http://www.summerseat.com/adirondack-chairs-newport-blue.html Or should I just stick with black? Barbara…wanted to add that I don’t want a country look to my house. Do you think that blue (if it’s a go at all) would make my house look country-ish? I was just looking at French cottages for another blogger and there were plenty with that French blue as an accent. I’m not crazy about it. The color really pops out because there’s no blue anywhere else on your house. I would rather see something warm, like a nice rusty red that can be seen in your stone already. Red would show up behind your black storm door. I would stick with colors in your stone to avoid the country look. Thanks so much for all the super input, I am going with your recommendations whole hog. I do have a couple of more questions. My husband mentioned the possiblity of a wood, leaded glass door, wood colored, for the front door. What do you think of that look with my house? Also, do you think the mudroom door should be the same color as the trim, or the same as the front door? Lastly, can you please recommend some exterior taupe colors for me? Thanks so much, you have been a huge help! I love solid wood doors. The storm door detracts from them, of course, as they’re hidden behind the glare of the glass, but I still like them. Since you already have side lites (the windows on either side of the door) I would go with a solid wood door in a medium to dark stain. That would be really nice. As for the garage side door, yes, I would paint it the trim color so people don’t get confused and try to find a doorbell to your garage. As for taupes, I don’t have my color wheel with me right now, but Ben Moore has some wonderful taupes in the historical color section. Like Shaker Beige, for example. Bring a few swatches home and see which one looks best with the grout/stone. Sorry for the delay. Your blog entry went to the wrong place but I found it. Yes, the doors can be different from the trim. And each other, actually. The front door can stand alone as the featured door and the real attraction to the house. For your house, if it is indeed contemporary, I would go with either a solid wood door to really accentuate the entryway. Or you could pick an accent color like a rust or red or even purple (for a contemporary house). If you send a photo, I can be more specific. But homes with a contemporary flair have a lot more leeway than their traditional counterparts so picking a front door color can be loads of fun. Hope that helps a little. Just send a photo for more specific advice. Thanks. 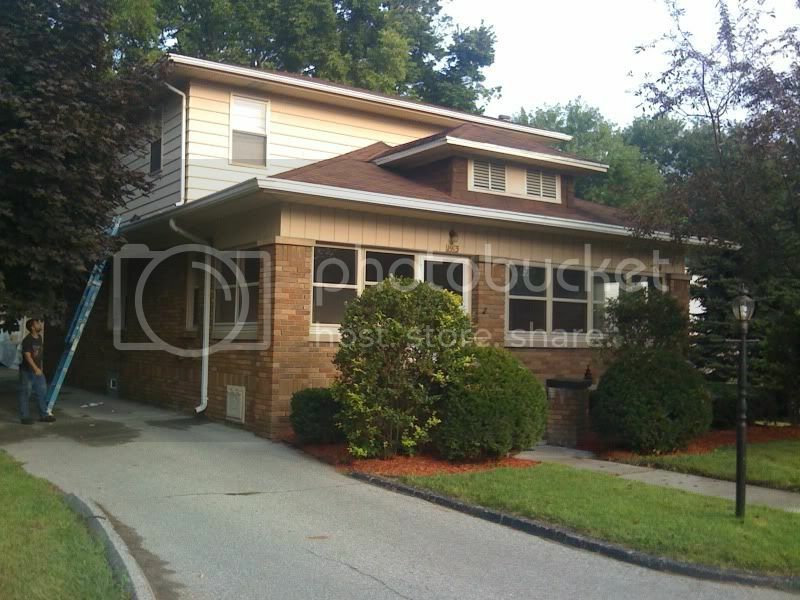 Our home has dark yellow/brownish tint siding and an all brown window trim. Currently the front porch is painted all brown. We are thinking about repainting the porch to brighten the house but cannot think of what colors to use. Would changing the windows and window trim to white help the cause? Would painting the porch two colors help? Sure, changing the window trim to white would definitely brighten up the house. You could then paint the porch white (except for the floor, which I would keep brown). That transformation would really perk up your house. We purchased a home with awful white painted brick and are doing a mini-face left to our exterior. We are re-siding the house beautiful new Hardy board shakes. 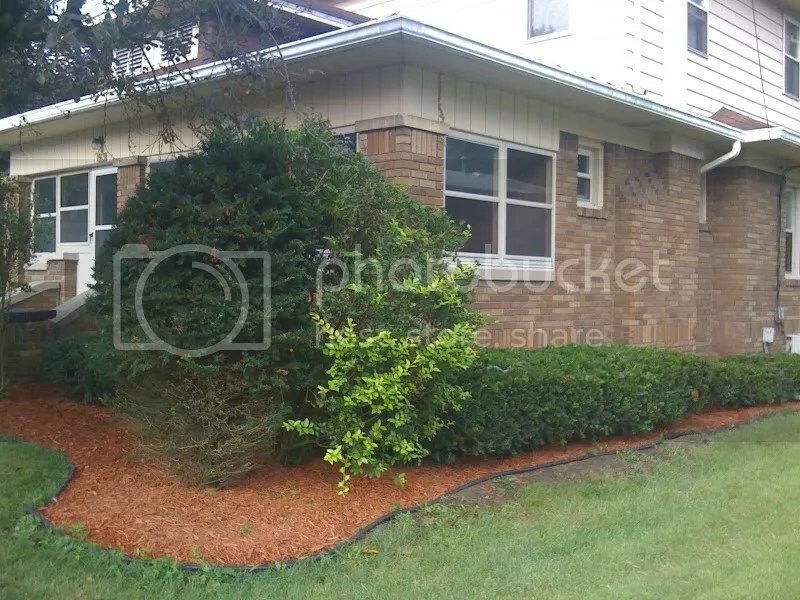 If we choose to paint the siding and bricks in two different colors (within the taupe family, likely), should the shakes or the brick be darker. The bricks are lower to the ground, of course, and I’d like to de-emphasize the painted brick. However, I’ve been told that dark belongs on the bottom, and you go lighter as you move upward. Any, any help from an expert would be deeply appreciated. If you want to paint two shades of taupe, the darker color would make more sense on the bottom, but if you really want to de-emphasize the brick, you might want to paint them the same color as the shakes. That way there will be a textural difference, but from the curb, you won’t see the brick as a separate entity. Everything will blend. Thank you so much Barb for your opinion above. We’ve selected an aluminum (for gutters) and fascia board pre-fab color called ‘hickory or natural clay’. We now need to select the paint colors for the brick and shakes (siding). Do you have any exterior paint color suggestions in the taupe family that you’ve worked with before? I’d prefer to steer away from the tan side of taupe, and more toward the greyish/green side if possible. My Sherwin Williams and Ben Moore books that I carry everywhere are starting to overwhelm me! I would match the color you just picked (hickory or natural clay) and do the whole house in that color. That way the gutters and fascia board will not stand out from the house. Then you can choose a contrasting color for the front door, shutters, and accessories. See how you like that idea. Our house has tanish brick with splashes of different colors of burgundy,brown,and some look almost terra cotta. We have dark brown siding around our full view burgundy storm door and on the porch ceiling. We also have a white metal door. I need to paint the porch and sidewalk. What color should I use? Do you paint the porch and sidewalk the same color? Whatever you walk on I would paint the grout color, probably a taupe color. That will make the brick color and the brown and burgundy stand out. The rest of the porch should be your trim color, it sounds like white in your case. I live in a unit complex and we are currently in the process of organising for the brick parapets on our balconies to be removed and replaced with clear glass. So as we embark on that we are also reconsidering the entire look of our property. We have the usual blond brick in apartments 30-40 years old. We have a flat roof. The trimming at the top of the buildings is currently a teal green, as are all the railings and garage doors throughout the property. We want a change in colour scheme that will fit nicely with the blond brick. Most on the Committee are saying a charcoal. What would you suggest? Charcoal would be okay, but I would rather see a bronze (dark brown) or a rust colored trim. I would be happy to get away from the teal green as it probably does not appear in nature and really sticks out against the other greens in your surroundings. Hope that helps. Anything will be an improvement — you’ll see. I want to paint my bedroom but it is a very unusual shape and I’m not sure if I should use one color or a combination of colors. The room is shaped like an A-frame but unlike a tradidional A-frame I have walls. The wall on the left is 8 feet high and the wall on the right is 3 feet high with the ceiling beam approx. 16 feet high that runs the length of the bedroom. This creates a massive section of ceiling that reaches from the 16 foot high center to the 3 foot high wall. I have a silk sage green duvet and some tropical paintings I picked up in Jamaica. Any suggestions for the wall and ceiling color? I think I would like to use a dark stain on the floors with possibly a soft/greyed gold area rug. Should I paint the walls and ceiling the same color or one lighter than the other? Any suggestions? I think in your case I would paint the walls and the ceiling all one color. You might try a nice soft blue like Ben Moore’s blue heather (1620) that would make your tropical bedroom like a tree house. Keeping the walls and ceiling one color will camouflage the asymmetrical walls and make the ceiling less of a distraction. You can use other colors but remember that cool colors recede and warm colors advance (a warm color like a nice golden yellow will make the ceiling come down to a cozier height). Blue for light and airy, golden yellow for warm and cozy. My house looks rather like a Halloween party gone bad. My husband and I want to change the shutter, door and trim color, but can’t figure out any colors that would look good. I’ve attached a link to pictures of the house, but you’ll need to copy and paste the link in. The area on the house at the end of the driveway is vinyl, so we can’t really do anything with that color. Any suggestions would be very appreciated! Here’s what I suggest. I would remove the shutters altogether and see how the house looks without them. Right now, the shutters aren’t really adding to the look of the house. You have kind of an asian-influence (the front stone garden) and the delicate ironwork. I would capitalize on that theme. perhaps remove the smaller objects and replace them with something larger and more of a focal point. It might even be a large boulder. Something that creates the asian garden that you have started here. Use that garden area to invite visitors in. As for the trim, I would stick with the grout color of your brick. It may be the light color of your vinyl siding. That’s okay. Then, I would suggest (if the budget allows) replacing the front door and storm door with something more streamlined and modern. The three-window-panel door is a bit dated and the white country-style storm door is a real focal point. Dark brown for the door and the storm door would be fine. With the shutters gone, the dark brown would stand out, compliment the iron, and draw people to the entry. One more suggestion (I know you didn’t ask for all this, but since the photos are so good), you might really trim back the hedges on the right side of the house to a tight sculptured look. That will also play into the modern/asian look. 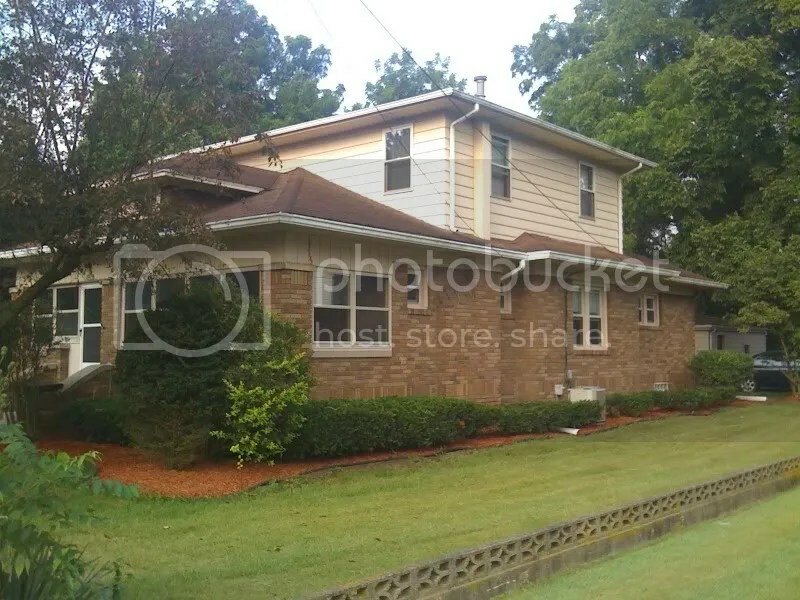 I am having a hard time picking a good paint color as the front of the house has a lot of brick and not a lot of trim and/or body color (with the exception of the two garage doors) but the back has an addition that is all body/trim. So, the front will have predominantly the brick with a little body/trim over the front door and the two garage doors but the back will have a lot of body/trim. I have tried to find coordinating colors and have not been happy with the samples I have put on the house to date. I am frustrated with painting multiple samples and not being happy. Please feel free to contact me if you have any questions. Any suggestions you have are greatly appreciated! Thank you for being there. Those are some great suggestions. Thanks. One thing, though, that I don’t think you could really tell from the pictures is that the shutters are actually recessed from the brick and are flush with the windows. I added additional pictures so you could see more clearly. So, do you recommend painting them the grout color or do you have other suggestions for getting rid of them? The grout color (as you’ll see) is basically gray. We appreciate you pointing out that we were going for an asian style. We hadn’t noticed until you said something! Hmmm, that’s interesting. What’s behind the shutters?? Brick? If so, I would still take them off the windows. But if you can’t, I would camouflage them by painting them the grout color or brick color. Not an accent color. Then they should go away. Here’s a suggestion. Take the color of the paint on the window sills under your front windows, bump the color up two notches on the paint chip, and use that for the trim on your house and garage doors. Then take a nice warm rust red or a rich chocolate brown and paint the front door area. For the back of the house, I would go back to the brick color and finish the rest of the house with it. That way your house won’t look chopped up from the side. So you have a blond color all the way around for the body and a deeper version of that color (a warm brown) for the trim and garage doors. And then a third color for the front door and maybe the triangle above the door. And I would try a brick red to go with your rustic landscape. We have a house with blonde brick and a white roof, trim and shutters. To me it is very blah. Any advice? I can send a picture if you send me your email. Well, we probably can’t do anything about the “white”?? roof. But you might consider adding some bronze hardware to the front of your house. To add some contrast. A light, door handle, mailbox, etc. Then you might want to try dark brown shutters. Again for contrast. With a white roof, you probably want to keep the white trim. But adding the darker color will jazz up the front a bit. 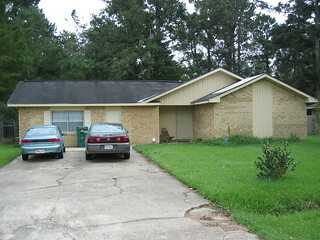 The brick house that we have has a wood garage doors, roof color similar to the brick color and white doors and windows. We want to leave the garage door as is, but paint the door and windows so that house has a warm and fairytale look with nice landscaping. What color would you sugest for the windows and doors. I would go with cream trim which will soften the contrast between the brick and the trim color and brown front doors. I think going with another color on the front door would chop up the house too much with such prominent garage doors being brown. I’m confused about what to do with our house. It is in the countryside completely surrounded by maple trees. It is quite shady. There are no neighbors nearby. There is a river where we can fish, swim and skate. Our kids look forward to have a dog, some chicks, rabbits and ducks… A far cry from our actual city life! We’re taking big risks but it is so exciting at the same time! My husband’s mind is set on red roofing. I think that beiges would look good with red but I ‘m afraid that is too bland for our taste. We feel this is a wild project that deserves a colourful scheme. I sent you the plans on your E-mail… Thank you! Consider a rich gold — the color of autumn maple leaves — to go with your red roof. It will be bold but with black accents, the house will look fabulous out there in the woods. And no neighbors can complain — all the better. Thank you for your advice! Where would put the black accents? By black accents, I mean metals (the exterior light fixtures, pots with flowers, any railings, even shutters). Hi, my husband and I are in the process of remodeling/fixing our 1937 brick house. We just replaced the shingles on the roof with a black shingle(it was called sablewood). Our brick is a “normal” brick color that matches the terra cotta tiles my front porch is paved with. We have wrought iron fences and railings painted black. We are having the whole house repainted. It will include the new eaves and soffits(they were rotten), siding around the kitchen door, the back “garage”(now the mil suite), the windows, and the front and kitchen doors will be refinished to the old dark wood stain they were. We are having new doors on the back part of the house, and they will be a dark brown bronzey color. Our house is a English cottage/tudor/vernacular style, so I don’t want it to look to odd. My neighbors house was painted white brick, and the brick was sand-blasted, but is still white-ish. They have white trim with khaki on their siding. We share a driveway, so I don’t want to match their house also. If I can find a picture, I will upload one. Do you mean you’re considering painting the brick or just the trim, windows, and doors??? A photo would be great. Ok, our computer crashed a couple of months ago, and we had to get a new computer. 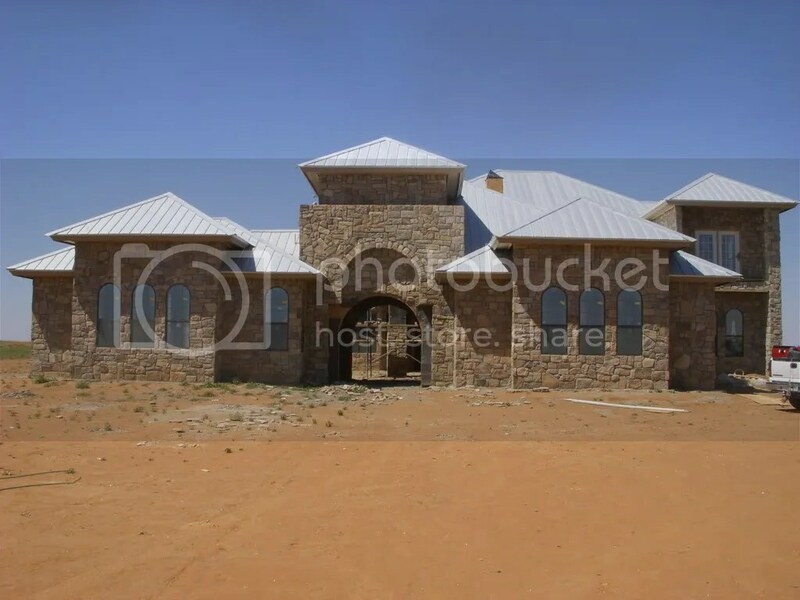 I was hoping some house pictures had been uploaded to photobucket, but unfortunately it seems none were. Can you still help? This is my neighbor’s house. We have the same style house, but my brick is terra cotta color…it really exactly matched my 1937 terra cotta tiles. I wasn’t able to pull up your neighbor’s house, but I think I get the idea. I love terra cotta especially with the wrought iron. The only thing I can suggest at this point is to paint the trim and siding a cream/slightly taupe color (or whatever color will blend nicely with the grout) and let the wrought iron stand out. White is too harsh and a darker color might look muddy. Picking up the grout color allows you to blend the trim with the brick and make the whole house appear pulled together colorwise. PS Don’t worry too much about your neighbor’s house. I think keeping your house natural sounds much better than painting the brick. We are going with the grout-colored trim (antiquey white/cream) for the windows, eaves, and kitchen door and other misc. trim. Our brick will stay it’s beautiful terra cotta color. Because the house has been added on to, the kitchen door has clapboard siding on either side of it to fill in where there is no brick, and the mother-in-law suite is reclaimed garage, so most of it is clapboard siding. In fact, all added on areas are clapboard. We are planning on painting the clapboard siding Providence Blue(by Benjamin Moore). The clapboard is about 30-40% of the house, but none of it is seen from the road. The painter’s were here today, and tomorrow they should start the painting the trim. It’s very exciting!! Sounds great. Good luck with the project! 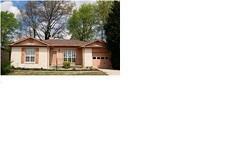 We have a 1967 tan/brown-speckled brick ranch with reddish brown shutters and front door. All of the houses in our neighborhood have some combination of white trim and black shutters, but I’d like ours to be different and more warm. I’m in love with the look and colors of Craftsman bungalows, but obviously ours is not a bungalow. Would something like taupe or sage green trim work for us? Someone had suggested Ben Moore Copley Gray trim, but I’m not sure if that would be too dark for the brick. I’d really appreciate your help. I’ve been looking for someone like you for years. 🙂 Also, what color for the door and shutters? Should they be the same or different? In the past, I have thought about a really dark eggplant, almost black. Thanks so much in advance for your help. I appreciate any advice you can give. I LOVE the Copley Gray idea for your house, but here’s what I suggest. Go with half-value Copley Gray for the triim and full value for the shutters. That way the trim is not too dark but it blends well with your house. Because the roof is so prominent, you need to blend rather than accentuate the trim across the porch and the shutters. Doing that will make your house seem bigger. Then you can go with the eggplant for the door. Your storm door is dark already so the eggplant will look fine behind it. I think you’ll be happy with the results. This is probably a silly question, but what does it mean to have paint “half value” or “full value” paint? I’m not familiar with that term. Also, is there any other color you would suggest for the front door, to go along with the Copley gray? I’m just trying to come up with a few options that I can show my husband. Take the darkest color of your brick and make it your shutter color (Check out Ben Moore’s Tuscany 1208). Then take a half value of that color (which is what you tell the paint store to make it half as deep a color — it’s just a lighter version of the same color) for your trim. That will blend shutters, trim, and brick and allow your front door to be the focal point. Personally, I still like a shiny black door with your brick and roof color. I think it really dresses up the house. But if ALL your neighbors are doing that, then you could go with a nice rich rusty red — a little browner than what you’ve got now. For added curb appeal (and when you’re ready to do a little renovation work), you might consider widening the porch entryway and steps and making the steps a little more substantial. That will enhance the look of your house and increase that welcoming feel you’re looking for. I love your website. My husband and I desperately need your help as we will be getting a new roof, windows, gutters, siding, front and garage door, etc. We have an orange brick house with hints of cream and black. We want a black roof and black shutters. We are thinking about a black front door as well. We want tan siding on the rest of the house to match the grout on the bricks. My question is, with vinyl windows, should we go with white or almond? Then what color fascia, window capping and gutters to match? Also, what color garage door? Would black be too much? I wanted to get a coachman style garage door, but the black hardware wouldn’t show up on a black door. I put a couple pictures on flickr, let me know if you can’t see them. Hi Barbara – Also, what color new decorative vinyl trim would we put around the front door (sides of door and triangle on top)? Thank you so much for your helpful advice. I just bought a 1921 dark brownish-red brick house. It is in need of plenty of repairs so I am in a position to make a lot of decisions about color selections all at once and am feeling a bit overwhelmed. In general I would lean more toward warm colors and would love to incorporate some green, if possible. First I need to select a new roof color. Then I also have windows, doors, trim, a rather prominant soffit, and stucco on second floor dormers. Any advise you can offer would be much appreciated. Black roof and shutters sound terrific. If your brick truly has cream and not white, I would go with cream trim and almond windows. If it’s white (it’s hard to tell from the photos), then go with white trim and white windows. As for the garage door, cream would be great with the black hardware. I love coachman doors! I would keep all trim the cream, including and especially around the black front door. Even the triangle should stay cream. It will be the real focal point once you have the black shutters on. As for gutters, match to whatever is attached to them, cream if trim, tan if along house. If you want to stay on the warm side, consider a dark brown roof to go with your brownish red brick. Then you can paint the trim a rich cream. As for the dormers, if you want them to be prominent, you can put your green there or if not, just pick either the grout color or a medium tone from your brick. Doing the latter will blend the dormers in with the house and make it look bigger. You can always reserve green for your front door. Hope that gets you started. Good luck. I have recently purchased a historical home that was built in the 1930’s. I wish the brick was blonde and more pale, but its is yellow! I hate it.. Also the siding on the top of the arches to me makes this house look cheap.. My questions to you are, do you think that there is brick under the siding on the top arches? And what can I do to make this house look more hip. I want to do something BOLD. I really don’t care about historical value, I would like to dye the brick more blonde or even paint is another color. The inside is so cute, but the outside is BLAH! Please help! I have attached some pictures below. The first picture is of my house and the 2nd is the color I wish it was.. I doubt if there’s brick underneath that siding, but you could always replace the vinyl with traditional shakes or shingles that would look less cheap, as you so aptly put it. As for color and what to do to make the house more “hip,” here’s an idea. My computer monitor may be playing tricks on me, but from your photo, it looks like your roof is a variegated new roof style with different shades of green and purple. It’s variegated, nevertheless, and it sort of clashes with the multi-tone orangey brick. So I don’t usually suggest painting brick, but unless you would rather replace a brand new roof, painting may be a good solution for your house. If you don’t care about maintaining the historic brick facade, then I suggest going with two different shades of sage green, the lighter shade for the body and a darker shade for the gables. The greens would look terrific with your roof (if in fact there is green in your roof and it’s not either my eyes or the monitor). Then to really jazz up the place you could use dark dusty grape purple for your trim. I know you want that blond brick color, but with your roof color, it might look kind of washed out. The greens and purple make a really pleasing color combination and they would certainly set you apart from your neighbors. I absolutely love your ideas on the sage. My room is a sage green and I love the color… I mentioned the color change to the previous owners and they were kinda upset with changeing the historical brick color. So leaving the brick color as is it what would be the next thing to make this house pop. I love the idea of affing tradional shakes or shingles to the house, that is something I am for sure going to do. Say I can re roof the roof and chnage the current ciding into traditional shakes, what colors would you use for the roof, shakes and trim? I love your ideas by the way! I even photoshoped the sage/dark sage/purple combo and loved it. But I am starting to respect that this is a old home and some things should stay as is. That said, with me only leaving the brick the color as it is, what colors would you use for the new shakes, trim, roof and windows? Thanks again for you input! Since we’re going to preserve the brick, how about lightening up the trim to a cream, keeping the taupe siding color for shakes, and topping off the house with a dark brown roof. That will create a little more contrast with the house and make it look a lot less drab. Then you can play up the dark brown with more antique bronze/wrought iron accents like on your front porch. Even dark chocolate shutters on the first floor would spread some of the brown around and create interesting contrast. But just separating the siding from the trim color (they’re the same at the moment) will help define the shape of your house and give it more zip. Good luck. Hope the previous homeowners like that idea a little better. Thanks for your fast response! I love the idea of a brown roof and iron accents, But I have to get away from the taupe color for the new shakes.. I just want to change it up. Maybe a color that is a bit more bold. Is there any other color combo you would suggest? Thanks for your time in answering my questions, I know my contstant barrage of questions gets annoying! Have a look at Ben Moore’s Mexicana (2172-30) or some of the other rusty red-browns. With a dark brown roof, the red-brown will add a lot of punch. Then you can bring that color down to the front door. I would stay with the earth tones for the shakes. Do you mean the Mexicana for trim color, accent or shakes color? Mexicana (or some version of the rusty red-brown) for the shakes color and the front door. Cream trim, antique bronze/wrought iron accents. And dark brown roof. The darker red-brown really accentuates the gables. I would just make sure that the color you choose has an orange/yellow base (and not a purple/pink base). That way the brick will coordinate perfectly. Another idea is an earthy green (like Louisberg green). Using a cool color on the shakes would make EVERYTHING (shakes, brick, and roof) stand out because you’ve departed from the warm palette of the brick. Either will work, but they’re completely different looks. Wow, you are full of great ideas.. I have some photoshoping to do to see which looks best! What kind of bronze iron accents would you suggest? Thanks for your help Barbara! Oh, one more thing. If one went with the Louisburg green for the shakes, would you still use the cream trim? Give me your thoughts on the following. This is Hodley Red from the BM Historical color pallate with cream trim. I am still undecided about it. Please excuse my poor photoshop skills, its is just to give an idea. It would be really helpful to photoshop the dark brown roof onto your house. That will help you see how good that brick can really look. Then try some rusty red gables and then maybe the green — I liked the color you used on your sample, but without the brown roof, it was harder to visualize. Try that (if you haven’t already). Yes, keep all the trim cream, regardless of shake color. That will really help! I was wondering if you could also help me out on our guest house we own. It also has the blode brick and is a bit blah.. I would love it if you could give me some ideas on what color to paint the trim, windows, gutters and door. Also, if you really could jazz it up and could paint the brick then what would be your choices of color for all the mentioned above plus the paint for the brick? Thank you so much for your help! I have attached some images below of our guest house. I would paint all the trim the same cream color that you already have on the fascia. Cream will lighten the windows and provide more contrast with the brick than the green does currently. As for the door, why not try a nice rusty brick color, almost the same as your roof color. It’s in an alcove and will be kind of dark, but it will be a welcoming entry. Then I suggest putting two wrought iron carriage lamps on the house, one on either side of the front entry. That will carry the black from the street to the house and give the house a finished look. We are thinking about painting the brick on our home. The home is about 27 years old. We have a 2 car garage not attached to the home that has just been repaired and we are trying to coordinate the colors. I have picked a light bamboo color for the brick, cream trim and a coffee bean color for the front door an shutters. I like the color combination but it’s hard to tell exactly what it will look like with your shady yard. I suggest getting a little of each color and finding a hidden part of your house that you can experiment on. Paint a swath of each, stand back and look, and live with it a day or so and you’ll know if the combo will work for your house. Hi! I love your website. It is very helpful. Me and my husband are currently trying to decide what color vinyl siding and trim to get. We are going to use this on the rust color wood. Can you please tell me what would look best? We are purchasing Variform vinyl siding. I can’t decide between Autumn Beige, Natural Almond, or Stone Mountain Clay(which is darker than the first 2). All colors listed are on the Variform website. We are also not sure about the trim, porch color , or door color (My door is currently a reddish/maroon). I would like advice on the windows too, our windows are larger than normal and I am not sure if shutters would work. One more thing we have brick on the side and back of the house that matches the stone in the front. We have a large deck in the back that is the same rust color. I am not very good at matching up colors when it comes to my home. My husband said that I must get it right since this will probably be on the house for the rest of our lives……. Thank you SO much! Your help really means alot. Hi! I am so glad I found your website. My husband and I have wanted to paint our home since we moved in two years ago and cannot decide on a color. We really don’t like the light brick and we hate the green! I painted the red door because I wanted to have some color pop. We are looking to add some contrast and color to our home. It just looks very boring and bland right now. I love reds, but am open to anything. We are hopefully re-landscaping in the next while, so please don’t mind the awful plants & yard! Thanks! I just purchased a home with grey brick/grey roof. Do you have any suggestions as to what I should paint the trim and garage door to make it look less bland and prison-like? Sorry for the delay. I’ll get back to your questions this afternoon. I like the autumn beige for your house with almond windows, both colors taken from your stonework out front. As for trim, I would keep it autumn beige except for your porch columns which can be the almond/cream color. Same autumn beige for the deck around the back. If you stick with one or two colors that come right out of the stone, that should lighten up the house and pull everything together. I would paint the trim a bright white. Then you could try either a navy blue for garage door and front door or black. THEN get busy with the accent color, something warm like pink or salmon. Use the accent color for a wreath on the door, flowers in the garden, a flowering bush in the front yard, and maybe even a couple of painted chairs. Your house will look smashing!! I have attached a URL for a Flickr photo of my home. In the summer, there are many plants and flowers, including window baskets. My question regards what color dye to have our stamped concrete porch, walkway, and patio done in: gray, to match the house, or brown, to go with the earthy landscaping and avoid a “matchy” look. When our roof is re-done, it will be charcoal or blue metal (we think), and we are getting a mission-style oak-tone front door. Also–would cedar shutters look okay against our gray siding? Thanks a million for your expert advice! Just in case the other URL didn’t work. Sorry for the delay. Even though it “matches” the house, I suggest doing a light warm gray concrete simply because if you do brown, everyone’s eyes will go directly to the walkway and not to your house, and I don’t think you want that. If you go gray with the walk, the beautiful oak door will really stand out and that IS what want. As for the cedar shutters, they will really stand out against the gray house, especially if the roof is gray. Personally, I would rather see gray shutters and really focus on the front door area and beautiful plantings and landscaping. Lots of times, the shutters are all you see on a house and everything else gets lost. Your suggestions make so much sense; I’m grateful for your expertise! Great website. I have read them all, but no one has my same home set up. View pictures. We want our home to be noticed. It is all one color with the gray roof. The roof has a tan and light cream blended into the gray. The white/cream brick, cream trim and white gargage doors. We have an oak door, which you cannot see with a big glass oval window with gold etched into the glass planels. What color should we do the trim and our door? The garage doors? We also use a lot of pots with flowers and greenery, what color should be paint them? We have a huge red/cream rock in the front of our home now that we got from a friends field. We are thinking of adding shutters to the far right window and the two far left windows. We need desparate help. We are landscaping the front after we put color onto the home. We want to stick to the earthy colors, but do not want brown. We live in Texas. We are from California where there is lots of color in the homes. We hate our all white home. Thank you in advance for your help in adding “life” to our home. The first thing to do is paint the trim white. That will outline your house with some contrast and highlight the interesting architecture. I like the idea of shutters (I probably would have chosen your roof color for tie-in), but you could add color with a dark olive green. I would reserve most of your warm colors for your landscaping — that will be a HUGE help. As for the front door, it is totally in the dark because it’s not only recessed but under an overhang. Two options: paint the door white (kind of a shame if it’s a nice oak door) or paint the brick in the recessed area white and leave the door natural oak. What the white will do is act like trim around the door to provide more light and really show off the door. If you dive in and paint the brick white, why not paint the brick columns white too. That will REALLY show off your house with grandeur. Your house is so big and the yard is so deep that when you do pots of flowers, think BIG pots, ones you can see from the road. Yours are a bit small to make an impact. It’s better to have two great big pots (one on either side of the entryway) than lots of little ones that you can’t really see. Same goes for the landscaping. Before you plant anything little, stand back on the road and have a look. And don’t forget to add some color out by the entry to the driveway. There’s an opportunity to create something grand along there. Good luck. Hope I’ve helped. I just bought this house & I hate the colors. It has white brick with ugly shades of pink for the trim. I want to make this house beautiful, but the white brick has to stay. What colors can I use for the rest of the house, the trim, the shutters, the garage door, and the front door to make it look pretty? Have a look at Ben Moore’s bone white for the trim, Roxbury caramel for the shutters and garage door, and Sedona clay for the front door. Those colors should complement your roof color but make the house a little less matchy. We just remodeled our home and have new windows (white)and trim with one small grid line around the outer edges of windows and a new front door. As you can see our garage has been replaced with a bonus room. The brick is reddish with white, black, and some splashes of tan in it. I was thinking about adding some shutters as well. I was thinking about going lighter on the body to make it look bigger and then I could possibly add some darker colors for trim and shutters to add contrast. What about the trim work around the windows & the gutters? Please suggest some color ideas that would match up well withe the brick. OK. Try this more more time. I am so sorry. I got the photo! I suggest a warm camel tan for your siding with white trim. The gutter would be painted tan. It looks like you have a green roof (from the photo) but it might be gray. And with the huge expanse of gray driveway you have, you need a warm color for the house. I wouldn’t worry too much about making the house look bigger. It’s a ranch and that’s fine! The only way to really make the house look bigger is to remove the brick facade and paint the whole house a lighter shade of the roof color (whether green or gray). Before revisiting the shutter idea, I would paint the house first. Thanks so much for your input. I like that idea about the camel tan for the body and gutters and white around the windows. What about the front door? Don’t I want some contrast? Also, the roof is gray. You can do the door in a red/brown from the brick. It should look great against the warm camel. As long as you pick colors from your brick palette (keeping the roof in mind, of course), you should be fine. My husband and I are racking our brains to figure out what color trim/gutters/shutters/door/garage door will match our orange brick home. Ideally, we would like to paint the brick, but I have read that it can be really expensive and just not worth it. What would you suggest? Should we go ahead and paint the brick? If we don’t paint the brick, what colors would you recommend for the trim/gutters/shutters/door/garage door? I’ve attached a picture of our home. Thank you for your help! Hi, we are building our home and need to decide on the trim colors asap. I am stuck, I have absolutely no idea what color to use. Our roof is metal (silver), and we have rock on the house. The rock is a mixture of reds, browns, pretty much every color except blue. I also have no idea what color to do the garage doors (when they get put in). My builder is really pressing me to get these colors, and I am stressing about it, lol! I am afraid dark brown would look to bland, and an offwhite would stick out like a sore thumb. Please help, I am in desperate need, lol! Oh and I forgot to mention that our windows have a black frame, if that matters, lol! I would keep the trim either the grout color (sandy) or cream and the gutters the same (downspouts can be painted to match the part of the house they’re in front of). As for shutters, I would remove them all, especially the ones by the front door. Hopefully, it’s not too funky behind them so that you can easily remove them for good. I would paint the garage doors and the front door a rich chocolate brown. And definitely keep your nice orange brick. It’s very pretty as is. You might consider replacing your green shrubs with some smaller varieties, especially by the far right window. I would include some dark red/brown shrubs (barberry) in addition to green to tie the landscape in with the rest of the color scheme. We are currently re-landscaping, so please don’t mind the awful plants & yard! Thanks! My husband and I are planning to paint our 30-year old native stone home. I love the red and orange tones in the stone, but want to go with something besides white or cream. The previous owners put taupe on the body of the house and a cream trim. It makes the house look dead and does not coordinate with the stone. We also have a deck which runs the length of our house on the front, so I would like it to stand out a little. What colors do you suggest? I am thinking gray-green for the trim and a neutral for the main body of the house and maybe a rust-red for the deck. It has already been painted, so we cannot stain it. I would use either a dark gray or a dark chocolate brown. 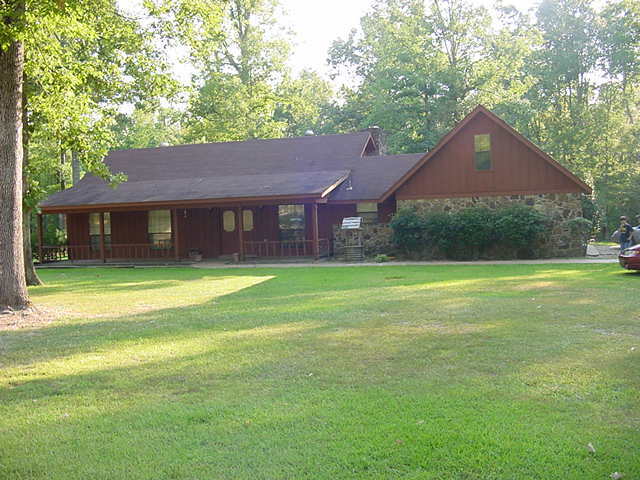 The gray (darker than the roof) would tie the roof in with the house and accent the brown shades in the rock. The chocolate brown would blend in (but still provide some contrast) with the rock and would highlight the gray stones (tying them in with the roof). I wasn’t sure from the photo exactly where the trim was going to go (slider upstairs? around front entry?) But since your roof is light, I would use a dark trim regardless. The real color issue with your house is not the brick and trim colors but (unfortunately, ouch) the roof color. Whenever you get the slightest leak, I would replace the roof with something either yellow-based (dark brown, medium brown) or a dark charcoal neutral. The light gray and the cream brick are not spectacular colors together. BUT never fear. Here’s what to do in the meantime. Paint the fascia trim (gutters, etc.) the same cream color as the brick. That will lighten up that area and call less attention to the roof color. Then you can paint the shutters and front door a wonderful red or a chocolate brown. Same with the garage door. Either one will add punch and liven up the house. I hate to settle up so quickly, but I really like your ideas for the trim, siding, and porch of your home. My only real suggestion is to make sure the shades you use come directly from the stones themselves. The gray green should be in the stone (it’s probably more olivey than sage). The neutral should be one of the warmer stone colors, and the rusty red more on the brown side. Keeping the shades/tones in the stone will make the house look coordinated and not allow any one feature (other than maybe the front door) to stand out too much, a mistake many people make. Thank you so much! I am going to go to the paint store and find some shades of those colors. Do you have any particular ones in mind? The trim color will go on the french doors upstairs, and on the eaves of the house. Our front door isn’t in, so it hasn’t been rocked around it yet, but there won’t be any trim color there. I think we are going to go with a dark solid wood door, like the round natural stained wood ones you would find on a church. Right now, the trim is a grey (the material they used for the trim comes in that color). Thank you so very much for your input, it really helps, as I said before I was lost in the color choice. I was wondering about one more thing if you don’t mind, do you think shutters would be good on our house, and if so what color, or maybe just a stain? Thanks again so very much. With the shape of your windows, I do not think you need shutters. Especially on the stone. I think the black window frames outline the windows beautifully and I would focus on that fantastic door you’re putting in. As for specific colors for trim, it’s hard to pin that down with just a photo. But I would stick to the colors that are in your stone. Then you can’t go wrong. You didn’t mention your roof color, but you could try either a dark brown or a dark green for trim. Both very classic (see link to example). We are trying to find the perfect colors for our stone “Georgian Revival” home in Philadelphia. Currently all the exterior wood is white, except for the creme steps and wood door. We originally thought we’d do creme and sage of some sort, but we’re thinking of going darker now and bringing out some of the darker greens or blues in the Wissahickon Schist stones, perhaps a two-tone green scheme throughout (bringing out the keystones above the windows) and painting the pillars white, and the porch floor maybe another color (or maybe one of the greens). I would love to hear your opinions on colors for this home. We are probably going to go with the Benjamin Moore Historic Colors. It is the second picture down. Your photo is gone from the site — sorry for the delay. I pulled it up but then had to abandon the computer due to massive thunderstorms. By my recollections, you could certainly do cream or a warm gray around doors and windows and a dark green trim around the perimeter of the house adding the dark green or even a third color like a warm rusty red to the keystones above the windows to accentuate that detail. The stone is spectacular. Since you are surrounded by greenery, I would not use green for your accent color. Instead I would choose something that will compliment the green and your brick. How about something like Ben Moore’s Richmond gold (HC-41) for your roof trim and garage door and a cream color like cameo white for your trim around doors and windows. That color palette will warm up your house and make the greens in your gorgeous yard stand out even more. P.S: I will send a picture as soon as the painting is done for you to see the results. 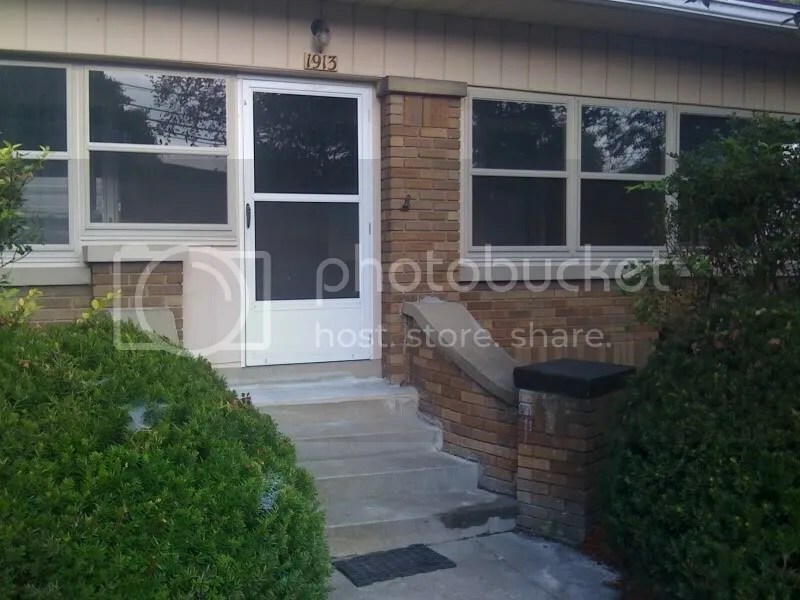 Since there’s a lot of brick around the front door and since the door itself is mostly glass (is there a solid door that’s open in the photos? ), I would keep the front door cream. I think with all the brick, the richmond gold trim, and the gold garage door, the cream on the front door will really pop. Your situation is very common. Many people have white windows and cream or ivory trim. Not to worry. I think it probably bothers you more than anyone passing by on the street. But, in order to blend the two colors, you need more of them. Hi, this is a great blog. I’m hoping you might be able to help us with some exterior paint colors. We have an orange brick house. We plan on replacing the two sets of french doors on our front porch. Currently the doors are white and the trim is white. Any suggestions for exterior door color? We were planning on leaving the trim white (unless you have other thoughts). We’d also like to replace the vinyl siding on the front of the house at some point – any color suggestions? We may also change the color of the garage door at some point. Listed under website are links to some pictures of the house (I was unable to place the links within the text, for some reason – kept getting an error message). Unless you’re planning to change the roof color over the porch, I would keep the white trim. I also really like your white French doors since it’s kind of dark on the porch. They really show up well from the street. As for the siding color, I would go with a medium tan/taupe/caramel color taken from your brick/grout. That way the house will look bigger, the brick will stand out, and the trim will look crisp. Whatever color you pick for the siding you can use for the garage door. That way the two buildings will coordinate perfectly. Hi. Thanks again for your advice. I am including the pictures of the paint job. I received many good comments. Thanks a million. Love it! Thanks for sharing your photos!! We’re purchasing a cottage style home. It’s a brick home with some wood siding and about 1/3 of the front is stone (the stone colors are gray toned mostly). The house also has shutters. I want to re-paint the whole thing. I want a home that reflects the mood and feel of an English country cottage. Do you have any recommendations, or web-sites that you know of that would offer a variety of paint options? I like to use all earth tones for an English country cottage, colors taken right out of the stone and earth surrounding it. You didn’t mention the brick color and whether or not you plan to keep it the same color, but I would start with the stone and move out from there. Taupe works great because it is tan with gray undertones and blends beautifully with grays and darker browns. English cottages often have thatch roofs so if your house has a brown roof (or even if it doesn’t), dark brown shutters might be terrific. They will bring out the gray in the stone front, an architectural detail you’ll want to play up. Often the windows are brown and there’s brown trim too. Not sure how far you’re going to take this, but you can find numerous photos of examples online. Hope I’ve helped you a little. We just had our kitchen painted Hathaway Gold (Benjamin Moore) and I’m not sure I like it so much now. Our cabinets are cherry. Those show up nicely! We have a morning room off of the kitchen with ALOT of windows also painted the same color. We have black appliances and I found a beautiful Waverly fabric, with a predominantly black background and some fruits on it which will help tone it down…but might you have OTHER suggestions? I don’t know if it’s b/c I’ve been staring at white walls in our house for the past 1 1/2 years (just moved in) or what, but is there anyway for me to DE-EMPHASIZE this new paint color without repainting? A couple of things come to mind: Usually people freak when they see such a rich color going on a previously white wall. It’s a big adjustment. I suggest finishing your windows with that fabric you described. It’s perfect. And put some art on the walls and accessories back out on the counters. Then if you STILL don’t like the wall color after a week or two, then email me back. I’ll help you tone it down. I do not own the house at the following link, but it is typical of the stone used in the Texas Hill country and I am wondering how one would perk up and add color to the trim. The stone does have individual pieces that show yellowish or rust like hues, but the limestone is very much white in the majority and though the roof is a very neutral, I would like to see a standing seam metal roof in a natural silver color. I wouldn’t hesitate to use dark gray greens to complement the stonework on these houses. A silver roof would be fine. But the stone has some green in it as well as rust, caramel, and brown. Those other colors will complement the stone as well. Bringing out the colors that are hidden in the stone will enhance the beauty of the stone by highlighting the variegation which is hard to appreciate when the house, roof and stone are all pretty much the same color. Thanks so much for this site! Attached is a link (I hope) of my house. I do not like the green trim color and was thinking of painting the foundation a taupey grey, windows and soffits white and black for the shutters for a classic look. This seems like a safe bet to me but I would really appreciate a second opinion. I will be replacing the first story windows with something more appropriate to the style of the house as well. You have a very tasteful aesthetic. I would go right ahead with your plans for making your home more historically accurate. All your color choices are perfect. Help! We have an older farm house (built1908) in Southern Ontario, Canada and need help with our exterior colours. The original house was red brick; however, at some point it was covered in a stucco material and then imprinted with a brick pattern. The colour of the huse is a mid-grey. We would paint it a different colour; however, both the detached garage and add on at the back of the house are aluminum siding in the matching colour and so we have to keep the grey for the house. The trim around the windows is white. Currently, our eavestroughs and shutters are black and the front door is dark burgundy. We would like to replace the louver shutters and change to panel shutter and were wondering if we could change the colour of the shutters. What do you suggest?? Any advice would be greatly appreciated. One color combination I’m seeing more of these days is grey with white trim and navy blue shutters and front door. You might want to lighten the grey on the house just a shade or two (it’s okay if the addition and garage are slightly darker — you might not even notice the difference) so the navy will have more contrast. Regardless, the white will contrast beautifully with the navy. I have a plain vanilla home where everything is basically just blond. We are about to replace the roof and the siding as well as the front windows and doors. My wife and I are so weary of thinking about how to ” put a bow on a pig.” We are willing to do whatever it takes to make this house appealing. Your help would be greatly appreciated! Your house just needs a little tweaking (consider painting your front door a darkish red/brown (something like Ben Moore’s Georgian brick) and maybe even replacing the tan shutters with more traditional black. Those changes will add much-needed contrast to your monochromatic house. Then focus on adding landscaping: a variety of tall and short shrubs and bushes in a variety of colors for the front (add planters along the driveway to separate off the parking area). Hi. 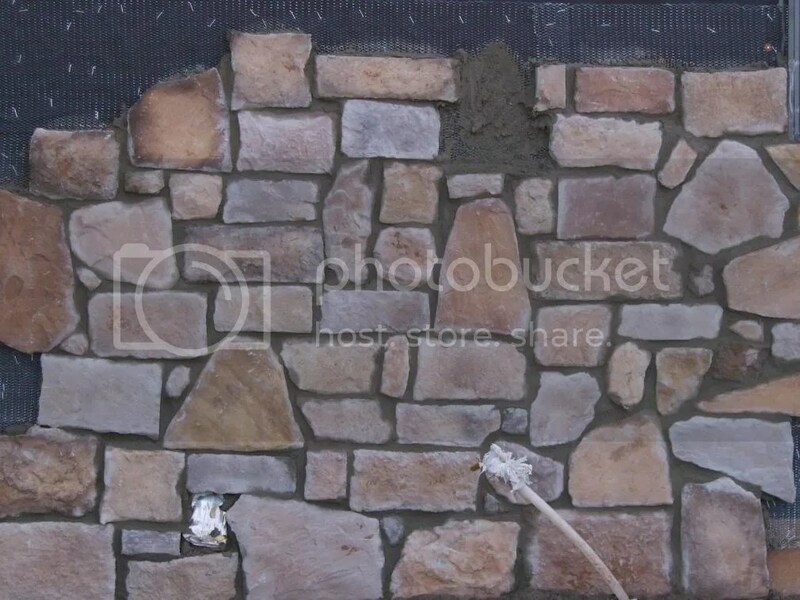 We have a grey stone home and need a material to pave over the concrete porch and walkways. We considered slate but were told that it gets slick when wet. My husband would like to use a brick paver in a rusty pink shade for a contrast. I would prefer something more neutral and am unsure about mixing stone and brick. Any suggestions would be great! First of all, it’s okay to mix stone with brick, especially if the brick is on a walkway. I agree about using slate — it’s beautiful but very slippery when wet and the variegation in color looks best with houses that are quite plain, probably not yours. Pavers, however, come in all colors, from rusty red to dark charcoal. Bottom line: If you want your porch and walkway to stand out against your stone house, then choose a color that will contrast with it. The rusty pink brick pavers will add some warmth to the gray. But a charcoal paver will add contrast as well (not so much warmth). There are many intermediate options as well. I would avoid getting anything with a mixture of colors simply to avoid an overly busy look. If you go with a gray or neutral color that will blend in with the house, then you will need to rely on plantings/flowers/accessories to add color to your house. Best advice: get a sample of each color that you like, set it on the porch, and go back to the edge of the driveway to look. You’ll know instantly which color works for you. I hope you can help me with my house dilemma. My home is a cape cod style home. The front of the house is brick and the rest of the house is wood siding. The brick is not one color. But, instead is a combination of several earth tones with grey mortar. The brick is really bugging me and I have been thinking that the house would look better if the entire body of the home were painted the same color. What would you suggest? Go ahead and paint it. The brick is not adding anything to the value of your home, and the house will look bigger, more unified, and more contemporary if it’s just one color. I suggest sticking with earth tones to minimize calling attention to the painted surface on the front. Tans, taupes, grays work great. Pair with white trim and black metal accessories and you’ve got an updated cape. I am building a house which will have Weracoba brick with tan mortar. I am having a hard time deciding what color for the trim, garage door and doors. If you have any suggestions, I would be greatful. Consider a warm cream for your trim unless you have white windows. Then you might prefer a warm white like White Dove (Ben Moore). For garage door and doors, you can pick something that goes with your roof color. If it’s dark gray, then consider black shutters. It’s very traditional, but you can’t beat the combination with the brick. My wife and I our building a home on a lake. It has a 2 story entry way with and arch, and a couple of turrets. We plan to have stone at our entry way, with stone on our 2 turrets as well. I like the idea of a light grey brick such as cottenwood, and a darker grey stone pattern, either flagstone or rectangular mix sizes. Do you have any suggestions for other grey brick color or stone combinations? Not specifically. But I do love the idea of using grey brick and stone as they speak to the lake environment, add additional texture to your already spectacular architectural detail, and give the new house a little history at the same time. Around here, all the natural stones are gray and round. Where we have our summer cottage, all the natural stones are gray and flat. Using a combination of natural materials from your particular area is the way to go. Your builder should have lots of photos and web sites to visit to get additional ideas. Wish I could be more specific for you. Thanks Barbara for your reply. My roof is actually black with sparkles of gray in it. Do you still think black shutters with white dove trim? And garage door being dark gray? I am so bad with picking colors…haha!! For a traditional look, I would stick with the same color for garage door and shutters. Black or dark charcoal gray will work but use the same color for both doors and shutters. Look at Ben Moore’s Affinity paint (wenge AF-180). For trim, you can go from a white (white dove is fine) to a cream like cameo white (much yellower but very nice). For a really fresh perky trim color, have a look at AF-20 mascarpone. Try a couple trim colors out and see which one you like best. Help! We have a small brick ranch and we are looking to paint the front door (which is on the side), garage door(faces the street) and the cinder block. Our windows and trim are white but the brick is ORANGE. Darker than pumpkin orange what color should we paint teh cinder block and doors. We have darker brown accents around the house too. Thanks. Not to worry about painting the cinder block. I would leave it natural, whatever gray that is at the moment. As for the doors, how about a rich chocolate brown? It will dress up the house and will avoid the more obvious black. Either way, I would keep the doors neutral to compensate for the color on the house. We are renovating a study with built-ins and using Ben Moore paints. The built-ins will be “Simply White” and an accent wall will be Terra Mauve. We painted the rest Mansfield Tan but we’re questioning it because its seems too yellow / gold. Any ideas for a color that would go with Terra Mauve and Simply White? What about moving down on the paint strip to either Camouflage (2143-40) or Olive branch (2143-30 or half strength of that color) for the walls if you think the Mansfield tan is too yellow. The grayer/olivey greens are wonderful in studies. See what you think. Yes, I would paint the clamshell shutters the same color as the house to make them go away. As for your front door, absolutely. The vibrant lavender/blue sounds perfect for your part of the world. Especially against cream and brown. I love the idea of coordinating the door color with landscape color. You’re set to get painting. Thanks for visiting my site. Well, I’m the latest to stumble across your wonderful site. Our house is faced half-way up with dark, dark brown brick. The rest of the house is painted a cream color that matches the grout. The trim is dark brown and the roof is black. We’ve torn up our front yard to re-landscape, and a garden wall around the front of a large tree will be prominent. However, the only wall stones/blocks we have found seem to be in the grey, terra-cotta, or tan families. Anything we’ve found with browns in it still seems to be too warm (the browns are too reddish, I think). Any ideas? Painting the house (not the brick) a different color is an option if it will help tie the wall in. However, with the brick being so dark, it seems difficult to pick anything much darker than cream! The roof will be replaced soon, as well. What would you do? If you’re up to it, I think that painting the house is a great idea. Consider more of a medium tan/brown for the upper portion of your house to give the facade less contrast (your house will not appear cut in half and will look bigger). Have a look at colors like Ben Moore’s Tyler taupe (HC43) or Nugget (AC-9). Depending on the tones in your brick, one of those might work. Then go with cream for your trim color (we’ve just reversed the color scheme). As for the wall, you can now choose grey, which will stand out quite nicely against the browns of your home. You can throw in a few terracotta stones just to warm the whole thing up. We are getting ready for a new roof. Our house is a traditional style with large columns at the front entrance. The brick is a very basic red with no color variation, our vinyl, soffit, and gutters are all white, and our current roof is black. Its a nice look, but I’m wondering how a color such as teak or driftwood from the owens corning duration line will look? What do you think? I love the teak as an alternative to your traditional black roof. The driftwood is more of a stretch since it has a lot of green in it and although I have nothing against green as a roof color, it does tend to draw attention to itself, and I don’t think you want everyone noticing your roof. I prefer the black/brown option, personally. Please help! I live in a 1950s blond brick box. Currently it has very (poorly done) depressing brown trim. The roof is a light gray color. Other houses in the neighborhood have white trim but it ends up looking like primer to me rather than a put together exterior color scheme. I thought about shutters but somehow the proportions seem off to me with the trio of windows along the front. Do you have any ideas on color scheme and balancing out all the horizontal lines? I think this link should work. I got completely sidetracked. Sorry for the delay. Your house could have a very modern look. How about choosing a paint strip, like Ben Moore’s 2139 or 2138 and picking your palette from the different tones on the same paint strip. For example, you might pick Gray Cashmere (2138-60) for your house color. Then paint the trim/windows Misted green (2138-50) and use the darker Carolina Gull (2138-40) for the door. Or you could reverse the colors for a richer house color. Anyway, keeping the house colors very monochromatic will increase its size and give it a modern edge. You can always add pops of bright color in accessories (flower pots, a bench, etc.). Just an idea. See what you think. My son is building a house and is quite aways away from us. He is young and is having a hard time putting colors together. He has chosen a slate siding and a harvest slate roof. He wants to use medium wood looking shutter with that. I suggested a wood clored front door and garage door Is there a site he can go to to put everything together and get a better picture of what he is doing? Does that sound right to you? Sorry for the long delay. If your son is still pondering colors, he can go online to any of the vinyl siding sites where he can play with colors and finishes, including brick, and roof colors. Otherwise, making a photocopy of the house plans and getting out the colored pencils works for me. Good luck to him. Your advic sounds good! He is also using brick just on the edges of the house. Hello and thank you in advance for your help. I have a cream or blond? brick house, with wood trim, gutters and garage doors in classic cream (a few shades darker than the lighter cream brick). The shutters are brown and faded, as are the three metal awnings (?correct term?). 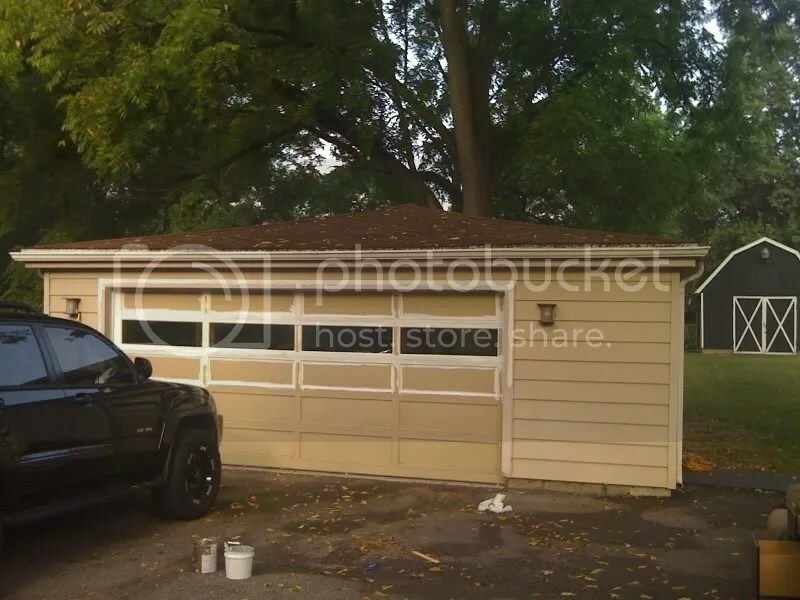 We recently replaced the old cedar shake roof with Fossil Grey Capstone shingles (http://www.canyonrock.com/Content/GAF/RES1/ROOF/capstone-sample-fossil.html), and the flashing is sort of a dark taupe with grey undertones, both of which obviously looks terrible with the brown. I need to know what color to repaint the shutters and metal awnings. I would love to replace the three awnings with copper, but it will be a few years before I can afford it. I am lost!!! Please advise…and thank you. How about something like Ben Moore’s Cromwell Gray (HC-103). It’s a gray green that should go well with the roof and very nicely with your cream trim and brick. I would paint the front door the same color for a conservative look (put more red from the brick into your landscape colors) or go with a rusty brick red to warm up the entryway and coordinate with the front walkway. I do like the copper idea for the awning. The shutter color would not have to be changed when you sub out the awnings. Forgot, the main door is a matching brown and will also need to be repainted. Should we go with the same color or different that the rest? The last bit of info is that the brick sidewalk to the door is deep red brick. Again, your help is sincerely appreciated. We have a Colonial style house with white brick and flex of pink throughout the brick. The mortor is dark grey/brown sand look. We are replacing the old white aluminun siding with a vinyl replacement. What color would go best with the white/pink brick on the bottom of the house. What color shutters would you select? We currently have burgundy shutters and white siding. If we pick a darker brown/taupe for the vinyl, would it make the house look top heavy? We are going to trim the house in white siding. To match the three white columns, the white muttons in the new windows and the white flex in the brick. The other color choice we were thinking is a lighter tan. Any ideas would be greatly appreciated. I suggest either a warm grey if your grout looks more on the grey side from the street or a warm sandy tan if the grout tends to look more brown from the street. Either way, keep the siding light and your house will not look top heavy. White trim is fine. You didn’t mention the roof color, but if it’s a dark grey, then consider dark grey shutters (almost black). Tie the pink in with light pink flowers and flowering shrubs, and you’ll have a very nice look for the house. I am needing your assistance in helping pick a new house color for my trim and front door. The house is a light pink brick with a cream trim all over the house. The windows have the black solar screens on them. I wanting to give the house a new look and am unsure of my trim color to pick also I have been told by the house painter that most people pick a different color for the front door to make it stand out. Sorry for the delay. Have you considered using a soft Atrium White (Ben Moore) for your trim color and a shiny semi-gloss Black for your front door? If you have shutters, I would paint them black also. See what you think. Yellows are hard to match and it sounds like you might have picked a yellow that stands out too much from the brick. Try toning down the yellow trim to more of a cream, something like Cameo White (Ben Moore) might work or even a Linen White if the cameo is still too yellow. If either of those colors works, paint the front porch wall the same color and leave the white to your unpainted windows. Since your roof is black, you might consider adding black shutters and a black front door (red will work as long as it’s dark — something like Country Redwood from Ben Moore). I think that will give you a more neutralized house that should have good curb appeal. I have a brown brick home. I have to replace the shingles and am not sure if I am making the right decision in choosing charcoal gray architectural shingles. I want to replace the white siding with sage green. What color should I go with for the door, sidelights and shutters? Sorry for the long delay. Charcoal gray is always a safe bet for a roof color. You really can’t go wrong with it. As for the siding, a like the sage green idea. If the budget allows, you might consider a solid wood door for the front and black shutters (classic). As for sidelights, they would be whatever your trim color is. Recently my husband and I talked about painting the brick exterior of our house. We may be selling and want good curb appeal. Plus the color of the brick is just yucky! It is a yellowish/tan color – blonde maybe. The trim is white and double front doors & shutters are dark green. The rear of the house has a creamy-like siding. I hope I am describing it all OK. I think we should go with a paint color that “matches” the siding, like a tan. Then keep the trim white & paint shutters black and the front doors red. I don’t think my husband likes this combo. We are open to suggestions. Also, what does painted brick mean for resale. Would you recommend it? Before you proceed with a paint job, consider a few more options. You might want to paint the trim an updated taupe that would coordinate with the grout color on your blond brick and also go with the siding on the back. Another option is to paint the trim two-three shades darker on the paint chip than the siding color. I would avoid trying to match that color — it’s really hard to do. See if painting out the trim will update the house sufficiently and make the brick look more appealing. Hello… I’m not color blind, and tend to have a great sense of style on the “inside” of my house… That being said, now i’m moving on to the outside trim.. THe house is A typical Denver Ranch with a blondish tan brick, a redish brown roof and brown gutters…previous paint is this awful pink hewed brown color that is just terrible! But i’m stuck! I dont know what to do with the facia, soffits and shutters…Windows are Tan Vynle now. I really like the thought of a darker color on the Facia (to blend in with the gutters) and a lighter color on the soffits and door trim, garage door etc.. with perhaps a merlot color on the shutters? or even a sage color on them.. who knows.. any suggestions???? How about a new color scheme to go with your blond brick? Take a look at the Ben Moore Affinity colors: Fossil AF-65 for your light trim, Interlude AF-135 for your dark trim (and repainted gutters), and Chambourd AF-645 — a wonderful rich eggplant for the front door. Not sure if repainting everything is in your budget but just thought I would offer an alternative to the traditional blond brick color scheme. Hello Barbara! I have added a link to the house I am days away from closing on! I already know what I am going to do with the inside of the house, but I am confused about the outside. I think the house looks a little washed out. What should I do with the trim, garage, and the door? Also, I am confused about the landscaping. I live in South Texas. It is hot and dry! I also like to decorate with a rustic Texas/Mexico theme. Any suggestions? Oh yeah…I will be taking the criss-cross stuff off of the windows! Hoping that you could advise on paint and trim colors for our home. We have a 1960’s 4-level split that currently has gray paint and white trim and light orange brick. We would like to replace the storm doors and inner doors with new double doors. My husband would like to install paned windows down the line. Any suggestions as far as style and colors you would have would be appreciated! 🙂 We are in Minnesota and so have snow for much of the year, but our yard is full of oak trees and has a maple in front, so colors that would compliment our yard would be great! How about Ben Moore’s Richmond Gold (HC-41) with Cameo White trim (white is okay if you don’t want to paint the gutters, etc, but the cream is much warmer). Then use black metal accents. I don’t mind casement windows at all but you really don’t need shutters with them. More contemporary without them. But if you’re replacing the casements with double-hung windows, then you can keep the shutters. I would paint them black. That should warm up your house a lot! First, thanks for giving out advice for free. Very cool of you to do. 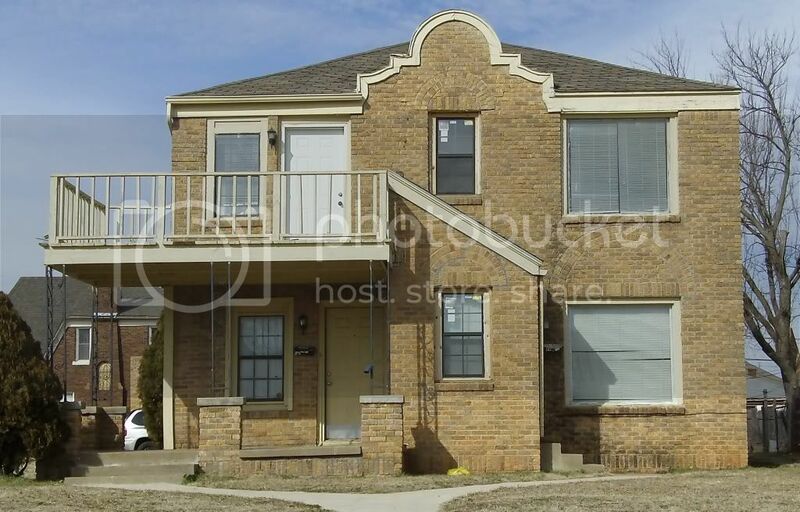 I purchased this house about a year ago… want to try and give it some better appeal. The house has orange/brown brick and the siding has an almost pinkish tint to it… definitely not my favorite. The roof is also red as you can see in the pictures. Looking for advice on just about anything to make this house ‘pop’. As you can see from the 2nd pic I’ve played around with some black on the stone and I really like the possibilities but I’m not sure how to implement this. The front sun porch is screened in which takes away the possibility of a really nice entry way. You’ll also see that I started to paint the garage door white which I did before finding this site. I realize the white might be too much contrast but again I have no idea what color to go with on the garage or house. The red roof seems to give me limited options as well. One more thing… should I consider shutters on this house? You have many Arts & Crafts elements to your house so there are many opportunities to add accent color to the architecture. I would start with a palette of a few colors that come from your roof/brick. Something like Alexandria Beige HC-77, Richmond Gold HC-41, and Hasbrouck brown HC-71 might be a start. If you can paint the siding, how about the earthy Alex. Beige? Then you can use the dark brown accents (as you’ve started on the front step) for larger numbers, mailbox, etc. You might even add color to the fascia trim (the gold?). As for the garage, you can paint it whatever the house color ends up and one of the accents for the door. For trim, you can stick with your white since the windows are white. If you cannot paint the siding, then do what you can to add accent colors (the beige) around the architecture (garage door, window sills, etc.). Check out some examples of Arts & Crafts exteriors online to get ideas of where to put the color. I am hoping that you can help me to come up with some palette options for a blonde (cream) brick home. My home is situated oddly because the side faces the street, while the front sits at an angle. I have uploaded my photo album because it is simply painful to describe. Many views attached. I do not want to paint the brick as I just had it cleaned and spot pointed (still in process). But I do need to decide what to do with my window trim, front door, fascia, guard rails, side street door entrance, and so on….. Thank you for your time and talent ~ very sincerely! Try this palette: Ticonderoga Taupe (Ben Moor 992), navajo white, and Georgian Brick HC-50. Using the taupe will provide some contrast around some of the trim work while the white will allow you to accent some of the architecture (columns). The brick red will pick up on your roof and walkway. I would keep your metal black, again for contrast. I’m not positive what specific colors I suggested for your trim, but take a look at both Ben Moore’s Alexandria Beige (HC-77) and Briarwood (Ext). Either one may work for your window trim along with either the cream you already have or something like Lancaster Whitewash HC-174, which might just look terrific with your brick. If you can, I would paint the window itself the darker color and the cream around the window and along the fascia/soffit and other trim. You can use the darker color for accents along the porch if you like that look (there’s a lot of beautiful moulding there) but leave the columns in the creamy color. I like your solid wood door but if it’s possible to lighten (scrape and restain or paint), then it will show up better behind the iron outer door. (Is that for style or security?). If for style, I would remove it so the inner door shows up better. Since you have a terracotta roof, you can pick that color up as a door color to add warmth. The Georgian Brick tends to work well as a door color. Not so great for other trim — it’s just too much. See if that makes sense to you. Hope so. And thanks for writing back. I’ll make note that you didn’t get an email allerting you of my response. Have to do something about that. I’m hoping you can offer me some color ideas. We have a 1910 blond brick with reddish-brown grout Victorian home. The base of the house is a reddish-brown stone that matches the grout. The current trim colors are cream, forest green, burgundy red, and a peachy color! The roof is forest green, but we’d like to replace that with a brown sometime soon. We have just finished a new traditional porch and would like to start painting it. It was white/cream with the accent colors mentioned above. What are good accent colors for a Victorian blond brick home? And what color should we paint the porch (ie, the columns and handrails)? We’d like for the new porch to stand out. If you’re changing to a brown roof, I would switch out the forest green for more of an olive green, eliminate the red and burgundy, and add in a taupe and a dark purple, along with the cream that you already have. Then depending on the location of the porch and what’s behind it, you can decide which of the darker colors to paint the porch to get it to stand out from the brick. Please help! I made a color blunder with my 1959 Cinderella style bungalow. I just had the house re-roofed with 30 year, Chestnut brown shingles; then picked a gray based stone for the 10″ planters, porch, and steps to front door. Is there a color combination that I can use for the stucco and trim that will balance out the clash between the roof and the porch and planters? What would you suggest (short of re-re-roofing, or painting the stone)? Thank you so much for sharing your talent with the rest of us!!! Thanks for your email. Not to worry. Have a look at the gray/tan taupes like Ben Moore’s Lenox Tan (HC-44) or Shaker Beige (HC-45) that can nicely bridge the color divide. If those still seem too brown to work with the gray stone, then look at Hot Spring Stones (AC-31). Then use a trim that has some gray in it, something like China White might work. That will tie in the stone and pull the whole house together. Ideally, it would be nice to mix some sandstone into your gray stone, but if that’s not possible, just use the paint to unify the house. See what you think. Hope that helps. See if one of these colors pulls some gray out of that blond/white stone. Take a look at these options: Ben Moore’s Revere Pewter HC-172, Edgecomb Gray HC-173, Shaker Beige HC-4 or Annapolis Gray (Ext). One of those colors might make that stone look a little more contemporary (send a photo to bmeglis@yahoo.com if you’d like) and look great on the siding. Use China White for your trim. Then to really jazz things up, pull the darkest orange from the stone and put it on the front door. Consider Sienna Clay 104 if the orange is terra cotta or something like Cornucopia Tan 119 if the orange in the stone is more vibrant. Another couple of oranges are Montana Agate 056 and Pennies from Heaven 063. Whichever orange goes with both the roof color and the dark tones in the stone. The whole idea is make the stone very neutral and grayed down a bit and then pop the orange onto the focal point, the door. The garage door can be the siding color or a shade darker. Hope that works for you. It will be a whole lot better than mustard with red. Use the richness of the brick for your color palette. How about Greenfield Pumpkin (Ben Moore HC-40) for the fascia along the roof line to accentuate the architecture. Then use Monterey white HC-27 for your window/door trim to accentuate the dark window color and metals, and Alexandria Beige HC-77, a very complex taupe, for your doors. Developing the palette from the blond brick family of colors will allow you to add color in an artistic way to your home. My husband and I are buying and rehabbing a Workman’s Cottage in Chicago that was built in the 1890s. One of the first things we plan to do is replace the windows with casement windows in the front that mimic the 3-over-1 pane design that is currently there. However, we are torn on the color of the actual windows and the trim. Other houses in the neighborhood seem to have white windows with cream or tan trim, but some have beige windows with a dark brown or cream trim. We also plan to replace the front door with a craftsman style door that has 3 paned windows at the top, but again, are torn on a stained wood door or one that is painted the same color as the trim/windows. The orange-ish brick is making things very tricky and I would love your thoughts! The white windows really stand out and make your house look smaller than it is. How about replacing the white windows with a taupe color that goes with the concrete steps. Andersen has both Sandtone and Driftwood, whichever you like better. Then paint the trim around all doors and windows cream. The combination with your brick should mellow the whole house, blending colors, and making the house more unified (not just a brick house with new white windows). As for the front door, keep the cream trim for contrast and shoot for a dark mahogany solid wood door (Craftsman Style as you suggested). Although the door is in a shadowed entryway, it will really stand out next to the cream trim and orange brick. Although bronze hardware is the most historic, if you want to give a modern edge to your historic home, you could add brushed nickel for your metal (porch light, numbers, door handle/lock). The silver tone will tie in the steps and taupe windows and give a little unexpected sparkle to your home. If that’s too much of a departure from history, bronze will work perfectly. It’s a matter of your aesthetic and how true to your historic home you want to be in your renovation. Having said all that, if you have no intention of replacing the rest of the windows and want to stick with white in the front, then use the taupe color to bridge the contrast divide between the white and the orange brick. Taupe seems to bring out other tones in the brick and make it quite interesting! See Ben Moore’s AF-135 Interlude. The taupe would go around the windows and along the fascia of your porch and roofline. Just scatter the taupe and white combo around the house and that will pull everything together. You can still have a wood door. Thanks so much for your advice. We are replacing the windows throughout the whole house with casement windows that have the 3-over-1 pane design. We will definitely stick with your suggestion of taupe windows, cream trim, and a dark wood door. You can’t see it from the picture, but we also have a basement apartment which has it’s own front door below the stairs. I was dreading putting paint on the custom door so I think we’ll stain it dark to match the main front door. Long term, do you think the roof is the right color? It’s hard to see in the picture but it’s a gray/green. We will probably not replace the entire roof for a few years, but we will redo the porch this year and will have to decide on the roofing then. Any thoughts would be much appreciated. I like the Weathered Wood on this site. Either that or a charcoal would probably work a little better than the gray green if you do replace the whole roof at some point. The orange brick is really enough color. Hello Barbara – What a great blog and thank you in advance for your kind assistance. We have a varied orange brick ranch home with a dark brown shingled hip roof, country blue shutters and white trim and gutters. The front and side doors are mahogany stained wood and white trim full glass storm doors. We have added a workshop in the back of the house with beige/taupe siding. We are adding a 2 car carport to the front on the house, turning the current carport into a sunroom, putting on new architecture shingles, and creating a new inviting entrance in front of the bay window, addressing the color of shutters and trim. Our mature neighborhood is older ranch homes with white or brown trims; but ours is the only orange brick with a hip roof. We like the idea of a half moon shape step in front of the bay window onto the porch, removing a section of the white wrought iron. For landscaping we like the idea of pebbles instead of mulch up against the house. We are looking for advice as to a new updated color scheme (solid or varied shingles, trim, landscaping, etc). There has to be a way to make our orange brick to look new and updated, but not a Halloween house or country looking. Also please share any ideas as to how to address the entrance to the new sunroom, not to compete with the front door. I do not like two entrances on the front of the house, it always confuses guest as to which door to enter. Looking forward to hearing all your suggestions. Here is a link to an album of our house currently. Since your house is a ranch and the roof figures very prominently, I suggest getting away from the high-contrast roof colors (gray and dark brown) and moving toward the medium-toned colors like Certainteed’s Driftwood or Weathered Wood. By using a roof color that’s neutral and the same “value” as the brick, you’ll make the house look twice as big! For trim, consider either China White, Bone White, or Edgecomb Gray HC-173 (all Ben Moore) to blend with the grout color and still go with the white windows. For shutters, I suggest something like Briarwood (Ext) — it’s a taupe that really updates the orange brick. I love the combination!! Your wood front door is perfect as is. But for the new side door, I suggest painting it the shutter color (taupe or whatever it ends up). That will make the main focus the front door and kind of blend away the side door. The other way to get people to use your front door is with the landscaping. Lighting and a clearly marked, slightly curved pathway to the front door will invite people to move that way instead of simply heading straight from driveway to side door like the pizza delivery guy. Speaking of landscaping, I love the idea of a half-moon front step/landing area. Very nice. But I suggest taking all of the white wrought iron out and replacing it with “wood-like” traditional columns/railing, painted the off-white trim color. That undertaking alone with update the house the most. The wrought iron is fine on a historic home but on a contemporary ranch update, it’s going to look a little too ornate. Simplify… that’s the mantra. Hope that helps, Debra. You’ve got a wonderful project planned. I would love to see the finished photos! Thanks Barbara – I am excited with all your recommendations. We are heading out to get paint samples to view the pallet with the house. I will send you updated photos when finished. If I may ask you to expand on two things, sense you said simplify is the mantra. Roof shingles – we love both the Driftwood and Weathered Wood, should we stay away from the high definition that varies the color more than just the standard? I found your facebook page and would love to share with my friends – if that is ok? First of all, thank you! And sure, spread the word. I’m trying to incorporate Facebook into my daily routine — so there will be more going on there on a regular basis. Hi – this site looks great. I am one of those color-challenged people and don’t want to make a mistake painting this old beach bungalow from the 1950s. I have made a “before and after” website and would love it if you would take a look at the exterior photos. I will soon have the soffit and fascia updated with vinyl and am struggling to make a decision on the color of them, the eaves, and the house since there are stone accents. I recently updated all the windows with white plantation shutters on the inside, and they are very visible from outside because of the large windows. That has me a bit stumped. Can you please make some suggestions? We are building a house and have selected the Austin cream stone for the exterior. We are installing a single entry door with sidelites and transom. What color or color combination should we use for the exterior finish of the door project? There’s nothing quite like the look of solid wood on a stone exterior. Have you considered a mahogany (or mahogany color)? Here’s a link to show you what I’m talking about. Send a photo of your house (or the stone you’ve selected) if you haven’t built yet. But from my research, the mahogany would be a great contrast with the stone and it would create a very dramatic entryway. Just read your email — I’m taking a look at the sample home you mentioned. Back in a minute. Have you seen the color Sedona Clay 2174-30 (Ben Moore) for a possible door color? It’s gorgeous with your Austin Cream stone. Then you could pull in the blue as an accent — something like Mediterranean Sky 1662. See what you think of that — warm, fresh, and fun. Barbara: Thanks so much–very appreciative of your informative responses. Your guidance helps me scope in on a plan for the color scheme. Barbara: I’ve read some of your responses to others on this site about choosing color of shingles. We are using the Austin cream stone for the siding. We will also stain the front door/sidelites/transom in mahogany using your suggestion from the first message. Can you recommend the color and prodct name for the shingles? You are currently reading Stone and Blond Brick House Trim Colors at Your Home & Color Coach.